Ever wonder why building a good vocabulary is so important and which are the best books to improve vocabulary? Vocabulary is one of the most important tools to facilitate communication. Because vocabulary is so important, it is wise to increase the size of your vocabulary whenever you can. Aside from being able to communicate your thoughts and ideas to others, college entrance exams and graduate school entrance exams test your vocabulary as a measure of your language skills in English. The size of your vocabulary is also a good indicator of your comprehension ability when reading new material. Finally, as students from other countries are learning English as a second language, they need to build their vocabulary. The dictionary is one of the best books to improve vocabulary. One way to increase your vocabulary is to open the dictionary and begin to read and memorize words. Though this method is simple and inexpensive, simply reading the dictionary and memorizing words is not always fun or effective. 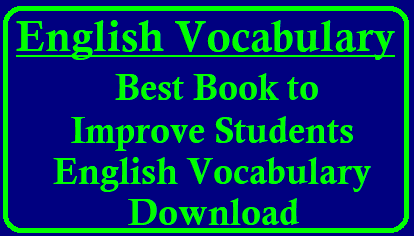 Another alternate way to increase your vocabulary is to read voraciously. By increasing the amount you read, you will increase the size of your vocabulary. A number of books on the market can help you increase your vocabulary.